As a member of Quarry Bank Musical Theatre Society you have unrestricted access to requesting tickets. What email address would you like to refer this order to? Singin in the Rain is set in the roaring ’20s and silent movie stars are the biggest names in the world. Don Lockwood has it all, a string of hit films and a studio-engineered romance with the most beautiful actress in town. But with the new phenomenon of the talking picture on the way and a chance meeting with a talented young chorus girl set to steal his heart, things are about to change for Don and for Hollywood forever. We are a friendly society that is growing from strength to strength. Having now performed at Brierley Hill Civic Hall since 2013 we have tried to build a reputation for pushing the boundaries both technically and artistically and are always looking for new ways to innovate in future productions. If you're interested in what we're doing, are thinking about joining or just want some more information then please feel free to visit our site QBMTS.org.uk and find out more. Brierley Hill Civic Hall has been host to artists, performers and theatre production since the 1960s and is in the heart of our community. But in recent years, its usage had dropped while costs have remained or risen. The Hall was often closed during the day and it was not operating at its full potential as a hive for all sorts of activity. In February 2015, Dudley Council entrusted Dudley CVS with rejuvenating Brierley Hill Civic Hall on an 18-month trial. This is part of Dudley MBC's move to become a 'community council', a council that enables and supports communities to do things for themselves rather than being a body that does things to or for people and communities. 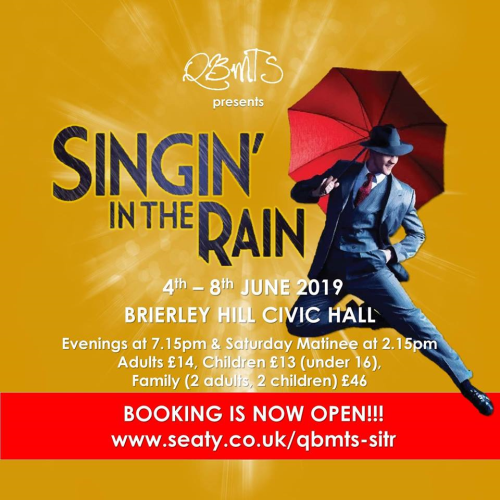 Dudley CVS have increased the usage of the hall, attracting big acts to Brierley Hill, making it not only the largest borough hall but the one most people want to visit! All ticket requests must be paid within 2 weeks by calling the box office to arrange payment. Unpaid tickets will be released to general sale after 2 weeks. Tickets are non-transferable and non-refundable Should you require a wheelchair please call the Box Office number as there are designated seats which can only be booked by the Ticket Secretary. Special Note - Ages 5+ -Babies and toddlers are not generally admitted to theatres. Children must be able to sit, unaided, in their own seat and be attentive to the performance so as not to distract other members of the audience. Admittance to the auditorium is at the discretion of the theatre management.